Before our gardens ever become available to us, we first have our forests and land around us. Growing up in Northern Michigan Foraging is a part of life. 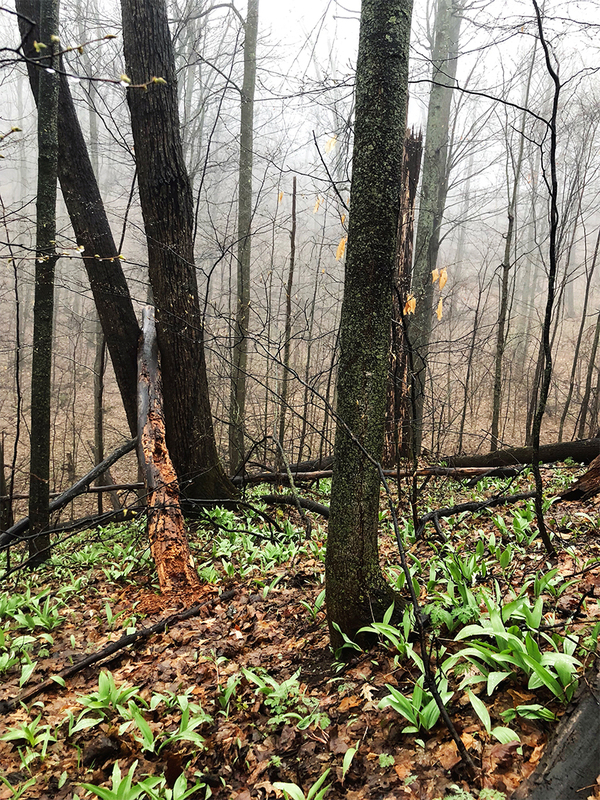 There are literally whole days set aside for days in the woods to find the precious goodies of the woods that come with the end of spring. I have practiced the basics for years as I have grown up and this year am planning to take more classes on foraging in order to better know the land around me and to get a better awareness of what is available to us here. From wild blackberries and strawberries to fiddlehead ferns to morels to stinging nettle leaf. 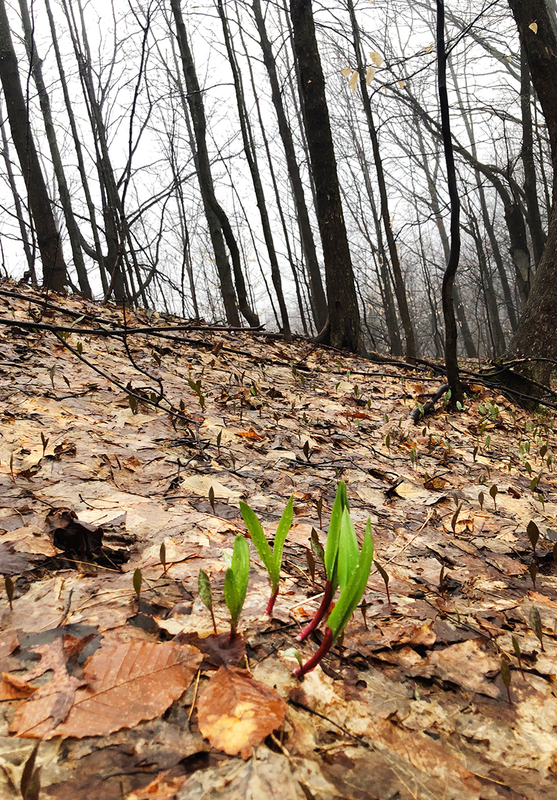 All of it is amazing, but one of the first we get the chance to enjoy are Ramps or as some call them, wild leeks. These guys pop up pretty soon after the snow melts right along with Dustman Breeches. They are some of the first green we see in the woods in fact, which is amazing and makes them easy to spot if you know what you are looking for. 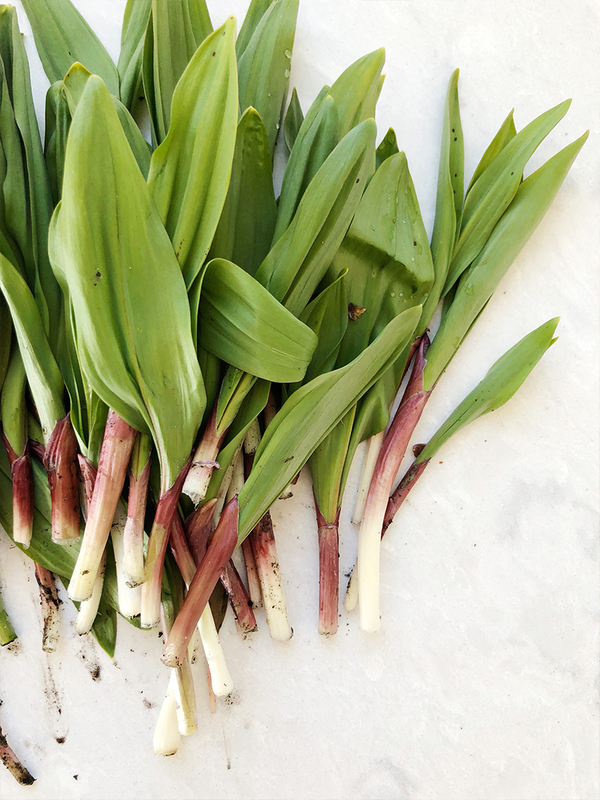 Ramps have tall leaves which are very yummy and the bulb which has a purple outer skin and a white base. I find they pop up in areas that are rarely touched or haven’t been touched by development in a very long time or EVER. The best giveaway is the scent. If they smell like ones when you break off a leaf you are on to them. When gathering them to take home, make sure you leave the bulb in the ground. This is how they come back. If you remove the whole bulb they will not return to that area. Another way to keep them going for a while so you can quickly return for another harvest is to leave one leaf on the plant so they can continue photosynthesis. These little guys are an early and wonderful reminder of the good things to come and we love to harvest them. Make a Pesto: Toss them in a blender with a seed or nut of choice, some grated parm, a garlic clove, lemon juice, olive oil, and salt and pepper. Blend them up and you will have an amazing pesto for pasta, tossed on sweet potatoes, or to mix into a dressing even. We love putting it on flatbread as well. Snip them fresh to top almost everything: We will just chop or scissor them fresh over everything you can imagine this time of year. Since they taste like onions they go with almost everything you can think of. Pickle them or make sauerkraut: I mean you can basically pickle anything or you can use them in sauerkraut as well. They will release a unique flavor over time as they ferment. Place them in an omelet or on pizza: Our neighbor cooked omelet with mushrooms and more on a sunday and he said it was amazing. We equally put them whole on top of a pizza and let them roast in the oven. Very good as well. 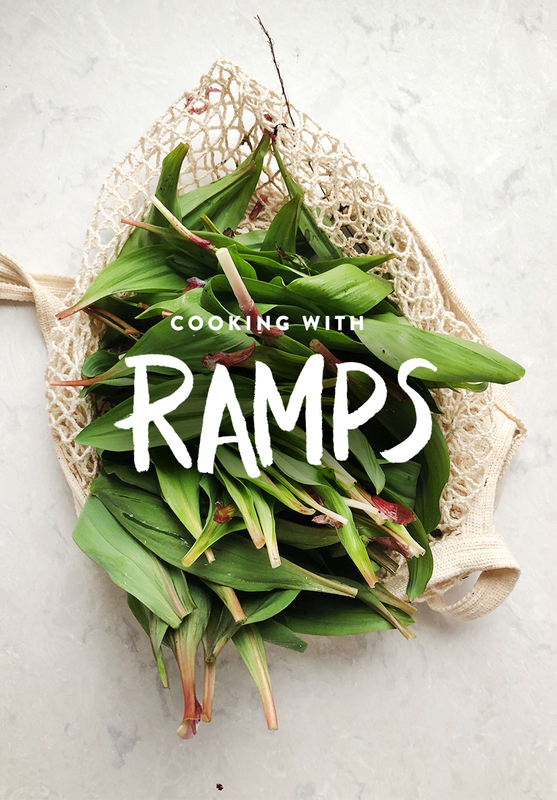 Truly ramps are really a great and easy thing to enjoy so gather up a handful store them in a air tight container after washing them and enjoy them throughout the week in different ways. As always when foraging you should always thoroughly clean your veggies before using them. A benefit to foraging is the healthy things it does for your gut. The foraging presents new bacteria in your system and the plants are very happy in their element so they will encourage healthy gut bacteria growth, but you want to make sure they are rid of some other not so good things lurking out there especially if you will be fermenting them. So tell me, did you grow up foraging? Do you love it? How much do you do it? I cannot wait to hear your stories about it. Also what is your favorite way to use these guys in your kitchen?! My mom forages ramps every year. Even til this day, she will not tell us her secret spot. All I know is it’s local. My favorite way is how my mom prepares it as it is very common in Korean cooking. She makes ramp kimchi with half, and the other half she pickles them for us to eat in the winter- which is so delicious! The ramps overlay is my absolute favorite! those letters are perfect. i am hoping to find somewhere to forage in southern california this year. ramp pizza is officially on my recipes to try list, yum! Seabeans are pretty easy to spot. The usual clams, geoducks, mussels. one summer i was about 11 or 12 Me and my sister would go to the beach to collect mussels. I broke a mussels against the rocks to reveal the meat where I would then dip my hand in the tide pools and wait for small fish to swim into my hands. I would catch small fish like this. A fish came for a nibble and swam away, i lifted my hands and the mussel flesh torn revealed a pearl, which being 11 I thought only grew in oysters. Almost threw it back thinking it was obviously just a rock, what kid finds a pearl when they are slingin’ mudpies and snatching up rockfish. lol.